We're thrilled to introduce a new guest artist, Mary Mata, scheduled to teach five workshops on August 11th and 12th. Mary Mata has been an artist and photographer for more than 20 years. For 15 years she photographed weddings and portaits. She designs and distributes a myriad of collage sheets, all created using her original art work and based on either her photographs or vintage item collection. Mary's value-priced classes provide the perfect opportunity to begin a collage journey or build on your current collage work. Class sizes are limited so don't delay in calling to reserve a spot. 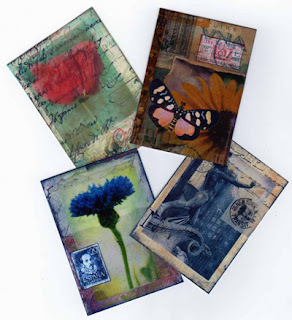 The photo on the left provides examples of ATC cards created with a transparency technique, offered on Saturday (the 11th). 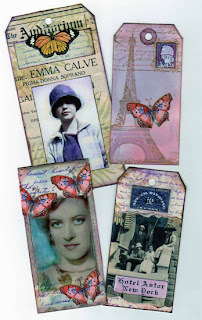 Tags are so popular these days in papercrafting, so Mary's class is perfect for those of you who have fallen in love with the trend. You'll have a selection of collage sheets from which to choose, and Mary will give you tips and tricks that ensure great success with your collage project. Check our website for the full schedule, description, and photos of these great classes. In other news, Patti is getting ready to attend the CHA Summer Trade Show, where she does a lot of ordering, some learning, some networking. If you have seen sneak peeks of products you "must" have, please let Patti know before Monday.